With seven regional winners and one national winner of the National Teaching Awards over the last nine years, saltash.net community school had many reasons to celebrate once again its attendance at the London final of the prestigious Awards on Sunday 21st October. 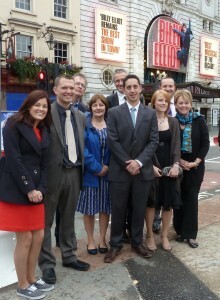 In 2012, saltash.net was the only school to be represented twice at the Pearson Teaching Awards Ceremony held at the Victoria Palace Theatre in central London. Teacher of History, Katie Boothman, was the regional winner for the Innovative Use of ICT, and the whole of the Science Department were the regional winners in the Team of the Year category. As regional winners, Katie and representatives from saltash.net’s Science Department travelled to London back in July to attend a reception at the House of Commons where one of those welcoming them was Sheryll Murray, MP for South East Cornwall. Accompanying the Science Department and Katie to London for the national finals were Head Teacher, Isobel Bryce, new Deputy Head, Dan Buckley (a previous national winner in 2003), and Assistant Headteachers Brendan Lee and Andy Oldfield. As part of 49 regional winners, saltash.net’s finalists enjoyed an excellent Awards Ceremony with Claire Balding as the compere and actors Anna Friel and Rhys Ifans, among many national celebrities presenting the coveted platos.